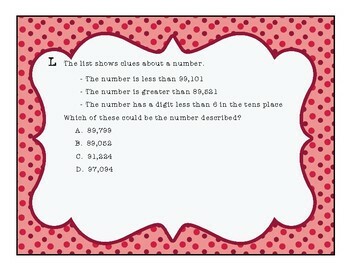 These task cards were designed to use in my own classroom as a targeted review of third-grade TEKS. 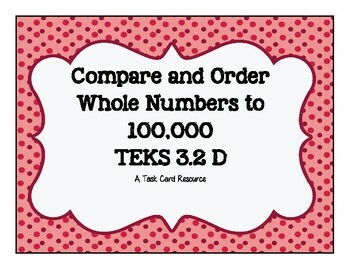 26 task cards for practice with the TEKS 3.2D: compare and order whole numbers up to 100,000 and represent comparisons using the symbols >,<, or =. A specially-made recording sheet and key are included. These are truly rigorous task cards, written with the process as well as the content standards in mind. I studied STAAR items and TEA supporting documents carefully to assure that I am adequate in preparing my students thoroughly for this TEK. 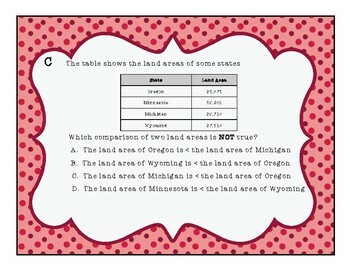 Task cards include varied models, and question types that mirror the STAAR assessment. I have also included both large and small versions of the cards to allow for flexible use in the classroom as a small group rotation, a gallery walk, or even as a set that students can access if they are working on individual learning goals. I hope they are an excellent resource for your test prep or year-round use!